On the eve of the winter solstice, Iranians gather to celebrate Yalda and bring this longest night of the year to dawn by reciting Hafez or Sa’di poems, or listening to the stories of a wise grandparent. They do this while eating off-season fruits historically believed to invoke the divinities and secure the protection of the winter crop. I vividly remember celebrating Yalda nights back home, because I felt so well fed on those nights, not on the spiritual foods of the poetry-reciting elders, but on the watermelon and pomegranates we had gone out of our way to find Needless to say, Yalda is well and alive among Iranians in diaspora as another rope to cling on to the far away home and culture. This song below, called “zemestoon” (winter) is one of my most favourite songs of the 70s; it is about bare gardens and trees and a lonely lover in the winter, accompanied by a beautiful clip of old Tehran in winter. 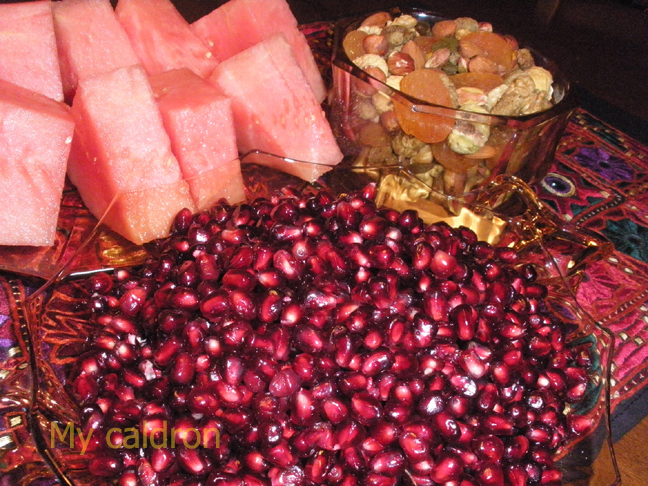 Happy Yalda 2011 everyone!